"Utilizes a fine-bristled roller to pick up fur and store it safely in a pet hair chamber until you can empty it." "Used dry and works best to remove hair from couches, curtains, clothing and bedding." "The handheld device folds into itself so you can toss it in your bag without dirtying it or picking up lint." "Comes with a powerful turbine tool specifically manufactured to get under couches and in small crevices." "It has the high-powered suction of an upright vacuum without the bulky footprint." "It works like an oversized rubber lint roller, pulling fur and hair into the tool for easy disposal." "The comb is made from stainless steel and works through your pet’s topcoat, safely reaching the undercoat to eliminate loose hairs." If the idea of a small pet hair-removing sponge makes you think “have you met my dog?” then the ChomChom Roller is a great alternative. Priced slightly higher than other hair removal tools, the ChomChom is one of the highest-rated pet products on Amazon because it really works. Unlike a traditional lint roller, the ChomChom uses no sticky tape or adhesive. Instead it utilizes a fine-bristled roller to pick up fur and store it safely in a pet hair chamber until you can empty it. It works well on all surfaces including sofas, beds and carpets. One reviewer says the ChomChom is “life-changing,” while another remarks that the roller is nothing less than a “game changer.” If you’re looking for a higher-end, effective roller, you’ll wonder how you ever lived without the ChomChom. This little wonder may look like an ordinary sponge, but it’s oh-so-much more that that. The Gonzo Pet Hair Lifter is easy on the wallet but works double-duty lifting pet hair from every surface in your home. The Gonzo is used dry and works best to remove hair from couches, curtains, clothing and bedding. It’s a great alternative to sticky rollers because you can use it over and over again. The Gonzo is about 3 inches wide and 6 inches long, so you can easily tuck it away in that junk drawer or cabinet when not in use. The Gonzo is best used on fabrics, especially flat ones like a sofa cushion or a sheet. You can also stash one in your car for the next time you take your pup to the dog park. In fact, at just under $6, you’ll want to keep one of these little gadgets in every room of your home. Ask a dog or cat mom and she’s sure to tell you she always has a lint roller ready to go in her purse. While the other handheld devices on our list are stellar at picking up fur from every surface in your home, a tiny-but-powerful tool is the best bet if you want something you can tuck away in a purse or briefcase. The Mudeela Travel Pet Hair Remover is the perfect tool for those pet hair emergencies when you’re away from home. Similar to the ChomChom Roller, the Mudeela device uses a brush with small bristles to grab fur and remove it from fabric. The handheld device folds into itself so you can toss it in your bag without dirtying it or picking up lint. As you sweep, fur is collected into a tray that you can empty at your convenience. Though we like other products better for at-home pet hair removal, the Mudeela device is a must-have for anyone who finds themselves brushing pet hair away all day at work. 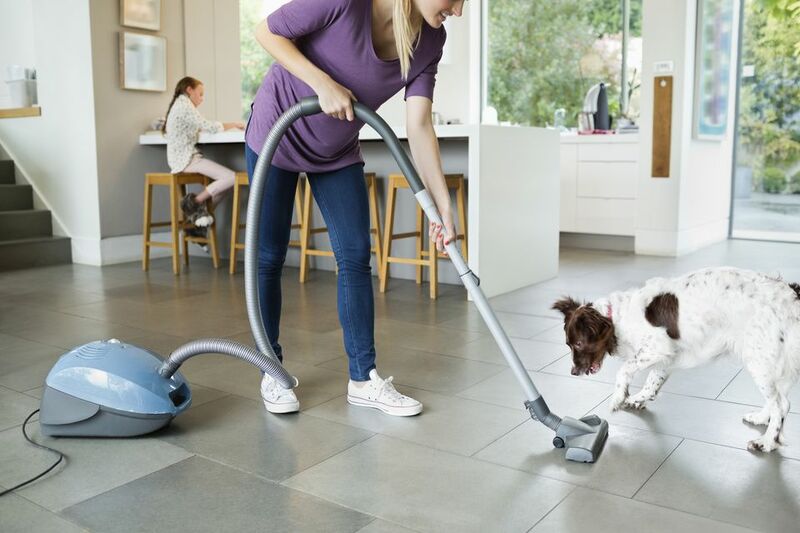 When you have a house full of pets, you know just how important a stellar vacuum can be for keeping your house in guest-ready shape. The Dyson Ball Animal 2 Upright Vacuum leads the pack when it comes to pet-friendly vacuums. At around $375 it’s a bit of an investment, but one you’ll never regret. The Dyson has some of the strongest suctioning power around, and this Ball Animal version comes with a powerful turbine tool specifically manufactured to get under couches and in small crevices. It can pick up even the lightest of pet hairs. The self-adjusting cleaner head can go from carpet to hardwood instantly, and the HEPA filtration system is perfect for pet owners who suffer from allergies or asthma. Dyson products come with a 5-year warranty against defects, so you know you’re making a safe purchase. Reviewers say this vacuum cleans even better than they imagined, and remarked that it’s perfect for homes with a lot of area rugs since it cleans evenly on any surface. If you live in a small space and don’t have room to store an upright vacuum, a hand vacuum is a great alternative. The Bissell Pet Hair Eraser Cordless Hand Vacuum is a great choice for small, pet-friendly spaces because it has the high-powered suction of an upright vacuum without the bulky footprint. It’s cordless, which means you can sweep away fur from every corner of your home without tripping over a power cord. It also includes an upholstery and crevice tool so you can use it on every surface while cleaning every nook and cranny. Meanwhile, the two-stage filtration system uses a long-lasting filter and a large dirt container to reduce allergens in your home. Bissell also offers some of the best customer service in the industry, providing a one-year warranty that is often extended in certain circumstances. Tuck this little guy away in your apartment or bedroom, and you’ll never wake up with a mouthful of rogue cat hairs again. Have a house full of hardwood? It’s time to ditch your traditional broom and invest in a FURemover Broom. A standard broom is just fine for typical messes, but when it comes to fluffy, floaty, hard-to-sweep pet hair, the FURemover’s rubber bristles are just what you need to eliminate hair from surfaces like hardwood and linoleum (without dealing with cumbersome dustpans). It works like an oversized rubber lint roller, pulling fur and hair into the tool for easy disposal. Think of it like a “squeegee” broom (it can even clean windows!). Now that you have the right products to sweep away pet hair, it’s time to focus on reducing your pet’s shedding in the first place. Enter the FURminator. Most pet owners have heard of the FURminator, and it’s definitely your best defense against excessive shedding. The comb is made from stainless steel and works through your pet’s topcoat, safely reaching the undercoat to eliminate loose hairs. It comes in five sizes ranging extra small to giant, and is available in both long hair and short hair versions — so you can match it specifically to your pet. Once the gadget grabs the loose hair, the FURejector button dumps it out for clean and easy disposal. The FURminator is one of the highest rated products on Amazon, and with over 11,000 reviews it’s easy to see why. Buyers say that it’s “worth every cent” — and once you own the FURminator, it’s safe to say you’ll wonder how you ever lived without it.